Second-seeded Egyptian Mohamed Abouelghar survived the longest match of his life to overcome India’s Mahesh Mangaonkar and claim his anticipated place in the men’s semi-finals of the Doha WSF World Junior Squash Championships in Qatar. 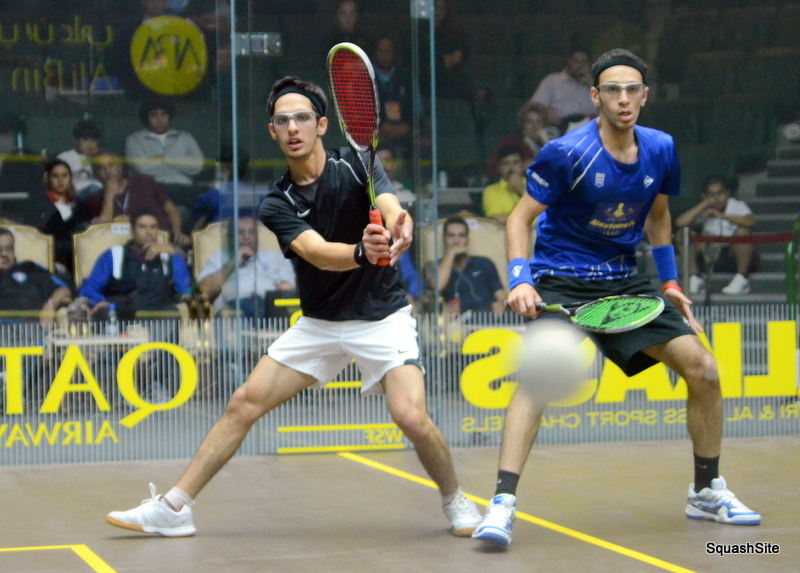 The 18-year-old from Cairo recovered from two games down at the Khalifa International Tennis & Squash Complexin Doha – then saved match balls in both the fourth and fifth games before beating 5/8 seed Mangaonkar 10-12, 8-11, 11-9, 12-10, 12-10 in 90 minutes in a match widely felt to be the best of the championships so far. 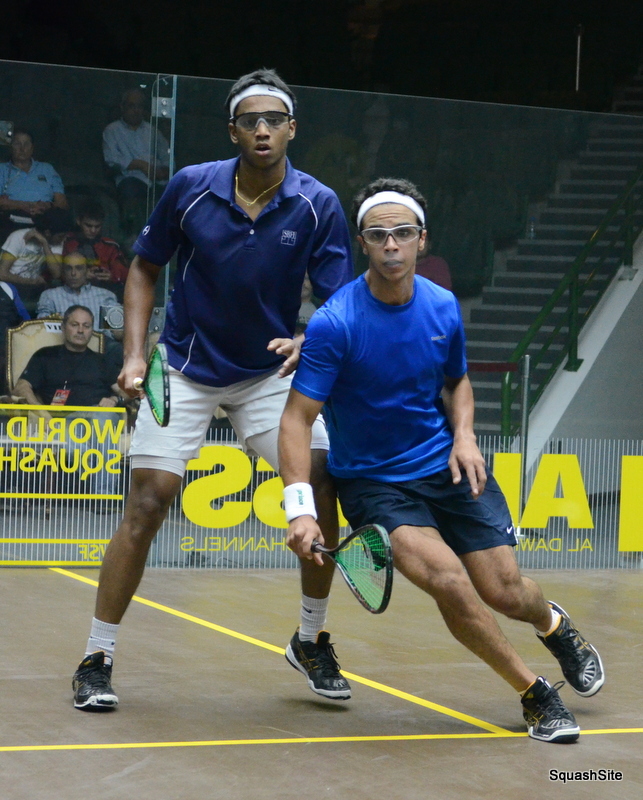 Abouelghar is joined by three fellow countrymen in the event’s last four – one of whom he will take on for a place in the final.Mazen Hesham Ga Sabry – like Abouelghar, also a semi-finalist a year ago – saw off compatriot Fares Mohamed Dessouki 11-7, 11-6, 9-11, 11-7. 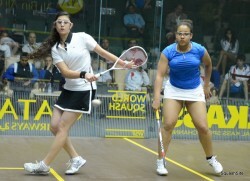 But Pakistani Danish Atlas Khan stands in the way of the third all-Egyptian world junior final in a row. The 3/4 seed from Peshawar ended 9/16 seed Ahmad Al-Saraj‘s brave run, beating the surprise Jordanian quarter-finalist 11-6, 11-8, 11-5. 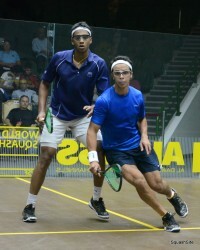 Kahn will be the third Pakistani to test top seed Marwan El Shorbagy. The defending champion, bidding to emulate his brother Mohamed El Shorbagy as a two-time champion, defeated 5/8 seed Nasir Iqbal 11-5, 11-6, 6-11, 11-9 in 53 minutes. 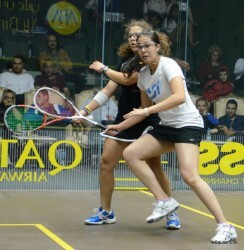 There will also be three Egyptians in the women’s semi-finals, with England’s Emily Whitlock providing interest for the rest of the world. The second seed and reigning European Junior Champion beat Salma Hany Ibrahim Ahmed, a 5/8 seed from Egypt, 11-7, 11-8, 4-11, 11-5 and will now face 3/4 seed Yathreb Adel for a place in the final. Adel stopped birthday girl Anaka Alankamony, a 5/8 seed from India, 11-4, 11-8, 5-11, 11-9. 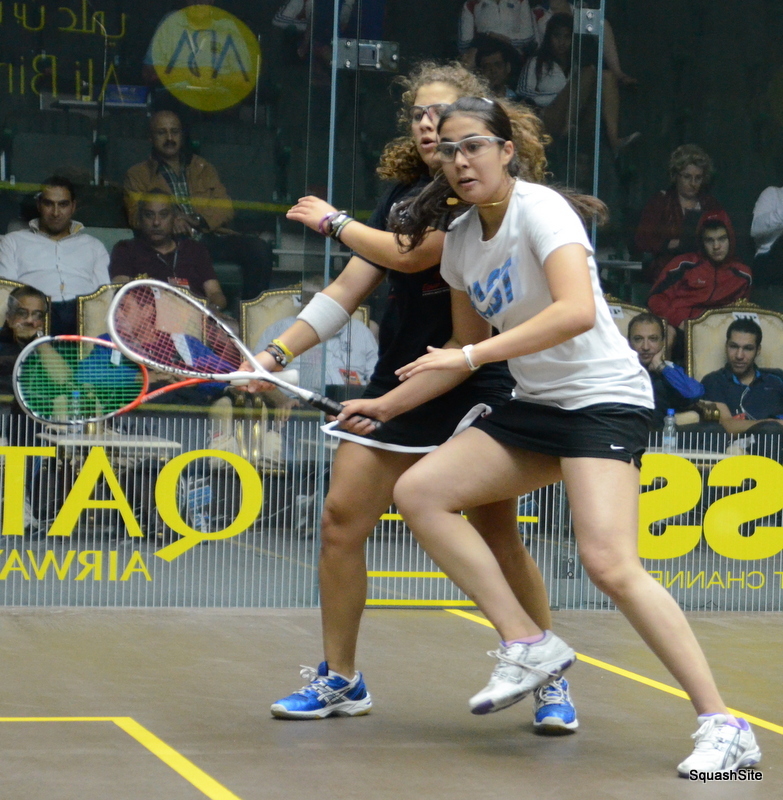 On paper, there was an upset when Mariam Ibrahim Metwally beat fellow Egyptian Kanzy Emad El-Defrawy, a 3/4 seed, 11-6, 12-10, 11-5 to make the semis. But 15-year-old Metwally was repeating the win in last year’s championship which made her the only unseeded player to reach the quarter-finals. The youngest player still standing now takes on firm favourite Nour El Sherbini, the former champion who beat France’sMelissa Alves 11-3, 11-5, 11-4 in just 16 minutes. El Sherbini, already ranked seven in the senior world list, has now recorded three successive wins in Doha in just 49 minutes of court-time! “I’m happy with my performance, even I made a few errors,” said the 16-year-old from Alexandria.